King Wawa and The Oneness King Band (OKB) are bringing the RESPECT MOVEMENT to the Bay Area and the world community, highlighting their success Friday, February 24 at the Ashkenaz Community Center in Berkeley, CA. King Wawa’s newest release “Respect Each Other,” is due out on February on his new album Respect Movement, and thus this performance will celebrate the seed of the RESPECT MOVEMENT. It is the spiritual soundtrack to deliver the healing power of love and humanhood to all. The essence of this music is to bring enlightenment to the soul, the heart, the body and the mind with the unique purpose to take us to a sea of Higher Understanding and communication, not only with ourselves, but with the Universe, from which we receive all life. The February 24th Ashkenaz show is all about bringing people together in a spirit of Unity, so that we can continue to bring enlightenment to ourselves and others, and we must do this together. Showcasing his song “Unity,” King Wawa will impart the importance of uniting to “win this fight” and “to free our minds.” The people of the world are facing serious challenges, and he stresses that if we do not come together to fight for what is right for ourselves and the planet, we will lose ourselves – soul, heart, body and mind. 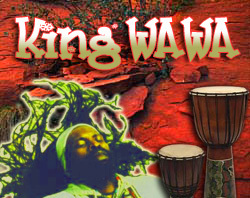 King Wawa was raised in both the Haitian countryside and the city of Port-au-Prince, where he was surrounded by popular, traditional and folkloric music. From its earliest beginnings on the Continent of Africa, the music in King Wawa’s spirit has been passed on through generations and generations of his ancestors and has been transported to Haiti where his family has continued to express and pass on the musical tradition. It has been a life mission of King Wawa to bring ancestral music to the world’s people, and by his music, to preserve the vibrancy and vitality of all indigenous cultures. As leader of The Oneness Kingdom Band since 1994, King Wawa has performed at many well-known clubs, festivals, and events and has toured California , Haiti and the northwestern United States . King Wawa is not only an accomplished singer, percussionist, guitarist, and songwriter—he is passionate about spreading a message of spiritual enlightenment and well-being to all people. Singing songs of peace, love, social justice and politics, King Wawa uses his music as a vehicle to raise awareness of not only the Haitian people’s economic and political hardships, but all communities in need from all over the world. He does this with joy, authority, and authenticity while bringing together listeners of all backgrounds and nationalities. The Oneness Kingdom is an original band skillfully flavored with a distinctive variety of music destined to transport the listener to a different world. Their music includes the rhythmic, soulful sounds of the Caribbean, Latin America, and Africa. The sound is tropically unique with a magic pulsation agreeable to the heart and powered to make you dance. Whether or not Haiti ‘s historical landmark speaks to you intimately, King Wa Wa’s music will most certainly take a hold of your being, both physically and spiritually. Our own personal revolution towards enlightenment awaits every one of us, and “Respect Each Other” can guide all of us there in harmony and good vibrations. It is King Wa Wa’s belief that when we respect ourselves and we respect others, the world is a better place for all humankind. This will leave a safer path for our children to follow.